I am supposed to write 7 things about me that you dont know. I dont know how this is possible, since I squeal about everything... But I will try. 1. I think I have OCD. not the cleaning kind. But the numbers kind. I cant stand for things to not be 'right'. I prefer there to be odd numbers, something in the middle flanked by equal numbers of things on the side. I prefer that all numbers I deal with to be equal. Like if I am paying something, I want to write a check for a 18.00 instead of 17.99 But if I am bidding on something I use .57 or .87. Always. 2. I round up in my check book. when I am in the black, it means I have a cushion that I didnt know I had. 3. I have not been to my grandmothers grave except once. I will take the kids, sit in the truck and let them go. I just cant bring myself to go cause I will break down crying, and I have managed to not do that in 4 years. 4. I want a tattoo. a tramp stamp really. Yellow roses with the stems intwined. I have wanted it for years. But never seem to have the money. Plus any time I mention it BR just ignores me. 5. I have my belly button peirced. But dont get to wear the ring anymore, and havent since I got pregnant with Bow. He wallers on me too much for me to wear it now. 6. I HATE onions, but love onion rings. If someone puts onions in something I refuse to eat it. PERIOD. 7. Seeing feet, especially mens turns my stomache. and I cant stand sandles on men. I tag the Fire Dept!! Oh and this is the second post for the day. So be sure to read 5 days till Christmas! Sorry I have been MIA this week. My dad left on Sunday, This time the kids and BR caught him. But I slept till 7. He also told the kids we could do the tree today, if they cleaned their rooms. So they did. Gee, wish I had thought about that.. I told them it had to be quick, The 'boys were coming on today and I was GOIN to watch the game. with or with out a tree. and there would be NO treeing while I was watching th game. I drug out all the boxes, got the tree together, and they proceeded to decorate it at 2 levels. Their heights. I had forgotten the candy canes, So I still had to buy them, and thought it could use some more balls. When it came game time I wanted some popcorn. I have a domed popcorn maker, you put grease in it and turn it on and it pops the corn. I searched the whole kitchen for it. EVERYWHERE. it was NO where to be found. I was betting the kids broke it and threw it away. It was old as dirt. then starting at 5:30 monday morning I was running around like a chicken with my head cut off. Monday was the start of Jingle Bell Junction at the school. Then Tuesday I was back up by 5:30, got the kids off and dressed and headed back into town. We had to be at our 4H CHristmas Party at 6:30. BEfore I left the school my grandfather called. It was another of those 'long way around the barn' conversations. Now mind you, I was trying to count the money for the day. and clean up the store, restock merchandise, and plan tomorrows strategy with the other worker. We had made enough today to pay off the bill of buying the stuff, so the next two days were pure gravey. That was SOOOO nice! "Are you picking the boys up from school?" "yep, I will be getting them in about 5 minutes, why whats up?" "at school, but it will be 15 minutes, they dont get out till 3:15 why, whats up?" " well, GO pick up Rayley from Daycare, (she went there that day, she LOVES daycare, and gets to go maybe 2 times a year...) walmart, I have to buy Secret Santa gifts for the kids party tonight, and refreshments, why, whats up?" "what do you have to buy, for who?" "The kids have a 4H party at 6:30, I have to buy 3 presents for the exchange, and drinks and cookies, its a BYOC, why, whats up?" "Bring your own COke, so, whats up?" "I want to buy the boys some cowboy boots for Christmas"
"we are at Baksins, can you meet us here?" "I reckon, but it will be a few minutes"
"Okay, well we want to buy the boys boots, and if they try them on we know they will fit"
"alright. Let me get done counting this money, get everything put up,and get Rayley and I will be there as soon as I can"
at 3:30 my phone rang again. I just answered by saying "I am on my way!!" So I went and Got Rayley, then headed to the western store. The boys picked out boots, tried them on, walked around in them, and Rayley found some pink fat babies. 59.99. she fell in love. She wanted THOSE. Alright. Except Hunney was just buying the BOYS boots. His wife had bought Rayley some clothes weeks earlier. But she didnt grasp that. She just knows that when its shoe buying time, everyone gets a pair. So I told her I would make sure Santa knew. And we tried on a few differnt pair. Finally found the ones that fit, they wernt the ones she had fallen in love with, so I convinced her that I would pay for them and order them and she would get them. But it did put a kink in my plans. Cause I have already spent all the money I was spending for Christmas. I didnt actually buy them. I am going to try to get them a little cheaper at Academy next week. We had fun at the party. I was able to buy the stuff we needed for the white elephant gift at baskins, and then a quick run into walmart for the soda and cookies and we were actually early. so they just put all their presents on a table. then drew numbers. She got a horse Puzzle. a hundred peicer.. She got it and hugged it and said "ohhh I love it! I have wanted one of these for years and years, I cant belive I was soooo lucky!!!" But the older kids were a little differnt. They played the 'take it' game. Where the second person could take the first persons gift and give them the unopened one that they drew. Brett drew halfway through, and got a hot pink lava lamp. He BEGGED someone to take it. Finally someone did. So he got handed an unopened gift , this time it was a set of lip gloss. A little girl ended up drawing the gift I had given. Stetson colonge and some other stuff. This is Matts ex girl friend, and she kept trying to talk him into taking it. Another little girl got a knife. everyone wanted the knife. But if someone took it, go and get it back instead of taking the 'wrapped' gift they traded for it, this is not how its supposed to work. But they just let it continue. It was just a free for all. Matt had tried to take the knife, as was his right. She imediatly took it back and gave him the unopened gift. Everytime it was a girls turn to draw he BEGGED them to take his lipgloss. Finally Brett ended up with a little pellet gun, I was thrilled when someone took it. Matt got stuck with a stuffed animal, then got back the cologne that I had bought. When it was all said and done, Matt was stuck iwth a remote contrlled Monster Truck, and BRett had that durn gun back. Once we were done there I had to go home and get Bow from my moms, BR was already home from work, he was working days this week. It was after midnight before I got in bed, and I was to the point of regretting only bringing one dose of sudafed with me that day. I woke up at 5:30 the next morning with a sudafed hangover, sick to my stomache from all the greasey pizza ( I ended up having to eat my kids pizza when they abandoned it for present time...) and a really sore throat. But didnt have time to dwadle. I did a quick run through walgreens when I got out of school, then a quick milk and bread run to walmart. And I was home by 6. After 3 days of me not being home, my house was a freaking wreck. I am not real sure why or how. Noone else has been here either, But even 5 minutes is enough time for my 5 to make a place look like a tornado hit it. I did some laundry. The kids were out of Christmas shirts, and jeans, plus I had to wash dishes. And make a path through the living room. the sudafed induced haze did NOT make it a productive night. I kept forgetting what I was doing. So I ended up with dirty dishes in the living room and on the dryer, folded clothes left on the kitchen table, and of course I put jeans in the towell cabinets. I did ask the kids if they had seen my popcorn bowl thingy. and they produced it. Seems that Rayley was using it as a boat for stuffed animals. I didnt ask why, I didnt even get into the "do I ever let you have MY dishes for toys?" discussion... When I fell into bed at 12:30 it was a blessing. I didnt sleep well. Bow has had a really bad snotty nose since Sunday, and we have been fighting it. He didnt sleep well so he didnt let me. Rayley was feeling the effects of 77 to 30 degree weather changes too. She had been drainin all week. benadryl was not keeping up with it. And she climbed in the bed with us too. 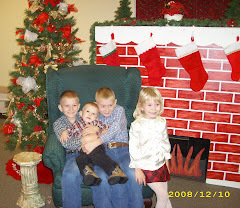 Thursday was the last day of Jingle Bell Junction, Plus it was the day for the kids parties. The first thing I had to do was go to EACH classroom. We had sold some Dallas Cowboys gold money clips. well there was 6 of them. When we sold the last one we realized, someone had gotten the display box. An empty display box. So I went around to all the class' and did the Vanna White thing. "who bought a Cowboys money clip for dad or grandpa?" 4 kids said they did. It was the 4 I had already checked out. Well 5 kids. but 2 of them were mine and we only got one money clip. Those had all made it home with the clips. I also had a kid tell me he bought 3 of them, but had lost one and that was his... poor kid. To be 9 years old and already lying. But the other 2 never came forward. ALL the volunteers that helped the kids shop were called, they only remembered the 4 that we already knew about. So we fiqure 2 were stolen. One will get away with it. The other will give someone an empty box. I am betting on a cussing come January 5th. But I tried to find the owner. I really did. We were starting to get busy in the shop, and the fire alarm went off. We had a drill. It was spitting rain and nasty outside, but they made all the kids go out in it anyway. Great present for all the parents. Sick kids for Christmas! Parents were walking up balancing cupcakes and pizza's and various other sundry for the parties adn had to stand out in it to wait for the all clear. RIght about the time I was headed to Bretts party, I had closed the store, started my inventory and needed to set up the room while the kids were at PE, I got caught walking by the office. A parent had brought in money for a kid to shop. So I found another janitor, unlocked the door again, and let him shop. Then I snuck back by the office, found another janitor, got it locked back and headed to parties. I had to leave Bretts early to set up for Matts. 4 parents showed up for Bretts, only one other for Matts. But there was plenty of sweets to go around! When they were done I went back and did my inventory, packed it all up and helped Matts teacher clean up after the party. She said that he was doing great, and was for sure all boy. Brett was saying he had a headache before we left, and looked like he was in pain. I opted not to take him to walmart and got home around 5. Brett was screaming and crying from a miagraine by 6:30. He puked up his medicane the first time out. Then he went to sleep. They did have school the next day but honestly, there was no reason to go. And with a headache like that I knew he would be suspetable to another easily. Matt started to feel bad about half way through the morning and laid down. He had a bad headache and didnt want to puke. that was fine by me. Cause he WONT run to the bathroom. he will stand there and tell you 'I am fixing to ..........' and puke everywhere. at least Brett will break his neck to get to a toilet. the other 3 were wound up tighter than an 8 day clock. I never did get a nap in. BUt I did spend the entire day fetching Bow out of the kitchen, off the table out out of the chairs, or being handed ornaments off the tree or candy canes off the tree. I thought I was doing good when I bought 4 dozens 'unbreakable' balls. Nope. Come to find out, if you bite them just right, you can break them. Luckily, if you just throw them they dont break. Bow did both. And its not like I just smiled and told him 'no no Bow, thats a bad boy' and patted him on the head when I took them away or fished him off the table. He is just hard headed. I had called my MIL to find out if instead of taking the kids with her on Monday to day care so I could take my mom to Lufkin to get their presents, she would keep them tomorrow on Saturday. She said she was takin her mom to get groceries. And that my sister in law AManda wanted us to all come to her house for Christmas Dinner. The first words otu of my mouth were "but she cant cook". "Oh I know, she is only making a ham. we are all bringing the rest".. Oh good. She would keep them on Sunday though. Great. So I called my mom. She wished it had been Saturday. there was something she had to do on Sunday, she would call me back. And Monday too.. But she couldnt remember what. GGGGGGGGRRRRRRRR we dont have a large window. Monday and Tuesday are the only days for daycare. and I really didnt want to send them. there is a chance they will be sick, plus my mother in law has to deal with them all day. And its money wasted. And truthfully she really didnt want them up there all day. I know that. which is why I very seldom if ever, ask for her to take them. I dont even like to ask someone to keep the kids. When BR got home last night he took the remote, and so we got a showing of movies we have all seen 87 times. I got Bow to sleep and by 9:30 was snoring myself. Again, I had fallen asleep on the couch. we were watching armageddon. Rayley had went and got her blanket and they were all layin in the floor watching it. Apparently BR fell asleep in his chair too, cause I woke up around 2 and he was still there and all the kids were in the floor. I just rolled over and fell back asleep after poppin some more pills. OH and I remembered that BR was going to be off on Sunday. So I couldnt take my mom then. CRAP. Maybe I would call my MIL when she got home from town and see about going this evening. But I fell back asleep- It was so blissful. Till 6am. when BR kissed me, waking me up to tell me he had taken the weekend off. Aparently he didnt want to keep the news to himself. So today has started. Around 7 the kids started to wake up. Thanks to Bow. But Matt just laid there. He was about 3 feet from BR's chair. And I was in the kitchen making breakfast. I thought he wanted me to see something on the TV, he was watching all the NFR finals he had recorded last week. "have you looked at Matt?" "nope.. I have been dealing with Princess Criesalot and velcro here." "feel him, he looks feverish"
I had to go to the store and buy some sprite, dope him up and am praying that none of the rest get sick. My house is a disaster, I had to cancle taking my mother to Academy in Lufkin till Monday, and I am still high as a kite from the sudafed. Have I mentioned that I have a weird reaction to cold meds? I try to avoid cold meds at all costs. But this week it was unavoidable to avoid them.. They make my brain feel like a ping pong ball in a round room.. just bouncing all over the place. We are talking space cadet canidate.. AND now I have to cook something for Christmas Dinner. I dont know what yet. I wont know till CHristmas eve I am sure. I have to find out what every one else is bringing. BR will be working, the kids wont want to leave their new stuff, and I already have to go to my grandfathers, do something with my mother (what I dont know yet, but something I am sure...) , and visit the great aunts houses. I really, really want the new living room built. That way I have enough room to invite everyone over here, and when they decline I can say "I understand, but we wont be able to come to your house on CHristmas day either". It used to work so well when I had a real house. Plus, if I do all the cooking I can eat all the food. I am a VERY picky eater. AND I can watch my football game, and my kids can play. whats the point in getting new stuff if you cant play with it? anyway, Its another weekend. with all the chores that weekends bring, and my whole immediate family is here, all wanting to sit in my lap, arquing over who is GONA set in my lap, or lay on me, or see who can make me get up the most to get them something. They are running neck and neck. But I am pretty sure BR is winning. Bow has 'almost' went down for 3 naps, but was woken up by someone or something each time. And the second I got him to sleep, and at the stage between falling asleep in my arms and being asleep enough to be laid down, Rayley was in here saying "I am hungry, can you make me something to eat!" Brett was nice enough to offer to make a sandwich. Which means I have a very large mess to clean up. And as soon as Bow started to snore, all the other kids were sitting on the couch, so no place to lay him..
OH and for the 4th time since I suggested taking her to Lufkin to get the presents, mother has asked me "why dont we just take them with us?" I just had to edit to add. BR just came out of the bedroom, he had a shower and now that I have Matt asleep, Bow asleep and the kids all quiet, he wants to take this trailer load of crap and trash we have to the dump... right now..